HANDI-FOAM® polyurethane foam sealants are moisture cured sealants, designed to completely fill and seal small gaps, cracks and voids up to about 3 inches. This fire block foam has excellent adhesion™and expansion characteristics ensuring a complete and permanent air tight seal. Straw foam products are designed for use without the need for a separate gun. This product is dispensed through the included flexible straw. Handi-Foam® Fireblock has been evaluated per ICC-ES report ESR-1868. Fireblock is an orange colored foam allowing easy identification by code officials. Handi-Foam™ is designed utilizing a non-flammable blowing agent to assist in the safety of the end user. 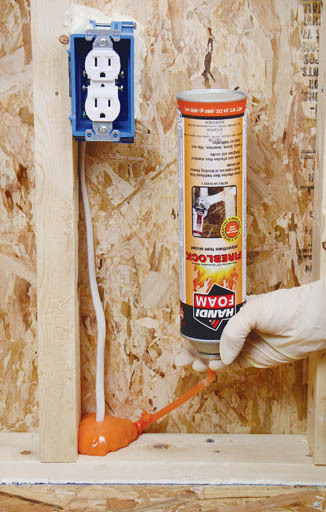 Handi-Foam™ spray foam, sealants and adhesives contain no Formaldehyde, CFC™s or HCFC™s. Can be found in data sheet or can label.